What a great idea! sample all of the old school classics without denting your wallet. 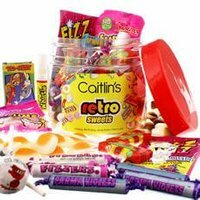 We’ve crammed an amazing 12 different retro sweets into this little jar! Enjoy the delights of Cola Bottles, Fizzers, Drumstick lollies and Popping Candy to name a few. The Label is fully personalised with: First Name of recipient: i.e. Samantha (up to 15 characters including spaces) Personal Message: i.e. have a wonderful day (up to 55 characters including spaces) The jar is 1 litre in size and measures 110x110x110mm Suitable for ages 8+ Contents may vary slightly 100g Fried Eggs 100g Cola Bottles 1 x Popping Candy 1 x Pack Candy Sticks 2 x Drumstick lollies 2 x Double Candy Lollies 3 x Refresher Chews 3 x Fizzers 3 x Parma Violets 1 x Candy Whistle 1 x Mini Love Heart Roll 1 x Pack Fun Gums INGREDIENTS: Candy Sticks Sugar, Corn Extract, Glucose Syrup, Tapioca, Beef Gelatine, Artificial Flavouring. Candy Whistles Sugar, Stearic Acid, Modified Starch, Acidity Regulator, Tartaric Acid, Cornflour, Magnesium Stearate, Flavourings, Colour: Anthocyanin. 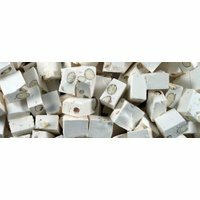 Cola Bottles glucose syrup, sugar, water, gelatine, citric acid, maltodextrin, flavouring, colour:E150d;glazing agents:carnauba wax, beeswax, vegetable oil Double Candy Lollies Sugar, Stearic Acid, Modified Starch, Acidity Regulator, Tartaric Acid, Cornflour, Magnesium Stearate, Flavourings, Anti-Caking Agent: Magnesium Carbonate; Colours: Anthocyanin, Copper Chlorophyllin, Curcumin, Lutein, Paprika. 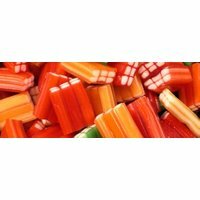 Drumstick Lollies Glucose Syrup, Sugar, Hydrogenated Vegetable Oil, Acidity Regulator: Citric Acid; Gelling Agent: Gelatine; Emulsifier; Glycerol Mono Stearate; Flavourings, Colour: Anthocyanin. 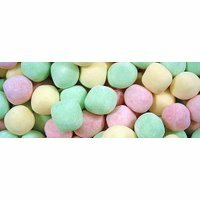 Fizzers Sugar, Acidity Regulators, Tartaric Acid, Malic Acid, Stearic Acid, Sodium Bicarbonate, Modified Starch, Magnesium Stearate, Anti-Caking Agent: Magnesium Carbonate; Flavourings, Colours: Anthocyanin, Copper Chlorophyllin, Curcumin, Lutein. Fried Eggs glucose syrup, sugar, gelatine, humectant:sorbitol syrup, modified potato starch, lactic acid, flavourings, glazing , gents:vegetable oil, carnauba wax, beeswax;colours:E120, E160aii May contain traces of milk. Fun Gums – Teeth n Gums Glucose Syrup, Sugar,Gelling Agent: Gelatine, Modified Starch, Apple Pulp (contains Sulphur Dioxide) Acidity Regulators: Citric Acid, Trisodium Citrate, Flavourings, Gelling Agents: Vegetable Oil, Carnaubawax, Colours: Carmine, Lutein, Paprika Love Hearts Sugar, Acidity Regulators, Tartaric Acid, Malic Acid, Stearic Acid, Sodium Bicarbonate, Modified Starch, Magnesium Stearate, Anti-Caking Agent, Magnesium Carbonate; Flavourings, Colours; Anthocyanin, Beetroot Red, Copper Chlorophyllin, Curcumin, Lutein, Paprika. Parma Violets Sugar, Stearic Acid, Modified Starch, Glucose Syrup, Anti-Caking Agent: Magnesium Carbonate; Flavourings, Colours: Anthocyanin. 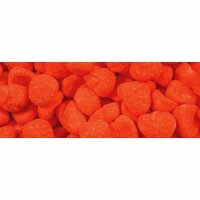 Popping Candy Sugar, Lactose, Glucose, Artificial Flavour, Carbon Dioxide E-290. No Colouring Used. Refresher Chews Glucose Syrup, Sugar, Vegetable Oil, Acidity Regulators, Citric Acid; Gelling Agent: Gelatine; Stearic Acid, Modified Starch, Flavourings, Emulsifier: Glycerol Mono Stearate; Anti-Caking Agent: Magnesium Carbonate; Magnesium Stearate, Colour: Lutein.